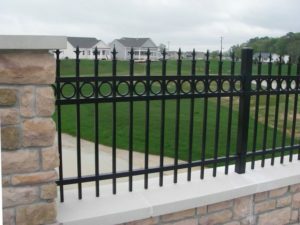 An aluminum fence is constructed primarily out of the element aluminum. Due to the metal’s low density and ability to resist corrosion, it has become a popular choice as a lightweight, durable fence and railing structure. Many residential neighborhood Home Owners Associations require aluminum fencing due to its uniform look from home to home. As it requires little to no maintenance and does not rust, the fences remain “new” in appearance for many years. Cornerstone Fence and Ornamental Gate of Connecticut installs aluminum fences that are used for Privacy fencing, to provide privacy and security; Pool fencing; Decorative or ornamental fencing, to enhance the appearance of a property; Boundary fencing, to demarcate a piece of real property (link), or Perimeter fencing, to prevent children and/or pets from wandering away. Cornerstone Fence and Ornamental Gate of Connecticut is a family owned and operated, full service fence contractor, based in Meriden CT. We have been proudly serving the states of Connecticut, Massachusetts, New York and Rhode Island for over thirty years. We take pride in the efficiency of our work; as well as our premium service. Contact us today to learn more about information on your aluminum fencing project.